Kristen has been practicing yoga since 2012. Her interest sparked when she took her first yoga class with some friends through a local city’s recreation department. She soon realized yoga was much more than physical exercise and improving flexibility. She enjoyed the calm, positive energy and sense of spirituality the practice brought her. Yoga balanced the stresses of her work life as a pediatric stem cell transplant nurse at Boston Children’s Hospital, caring for children battling cancer and blood disorders. Yoga not only has helped her stay grounded and grateful through all things that life brings, but it also allows her to take time for herself and enjoy life by living in the present. Yoga has since become engrained into her lifestyle and now she can’t imagine her life without it! Kristen is a life long learner so after a few years of dedicated practice, she completed her 200 hour yoga teacher training with Gail Lachs in 2017 and continued on with her training through Radiant Child Yoga. She became inspired to help others explore and find their own authentic path to well-being and self-discovery through the practice of yoga and wants to share these powerful effects with the world around her. Kristen believes in starting from where you are and that yoga has something to offer everyone. Her intention is to create a loving space for her students to feel comfortable to explore their mind and body to get in touch with who they are and where they are, allowing the freedom to find strength, balance, and purpose in their lives. She desires to empower individuals to be present, letting go of self-limiting beliefs and expectations of the future, and hopes to create an attitude of self-acceptance with inspiration to explore their edge and grow. 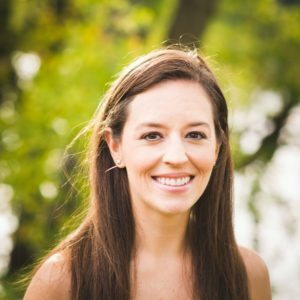 Kristen’s classes are well thought-out as she builds carefully sequenced, purposeful flows that are focused on safe alignment. Her classes are for all levels to enjoy and are designed to strengthen the body, connect the soul and quiet the mind by bringing awareness to the breath and body. She encourages students to be present, accepting of their imperfections and appreciative of the simple things. She also offers various modifications so every body can find what is best for them. Kristen leaves her students feeling grounded, calm, and empowered, with a renewed sense of optimism and gratitude for all that is and all that will be. She hopes the individual experiences on the mat create mindful living off the mat and that her students bring what they learned about themselves into their daily lives. She is excited to share in your practice and looks forward to seeing you on the mat!